Because this is a food blog and I need to desperately talk about some food…first things first. My last night in Salt Lake we dropped by Bruges Waffles and Frites for “dinner” (yes, we had dessert for dinner). 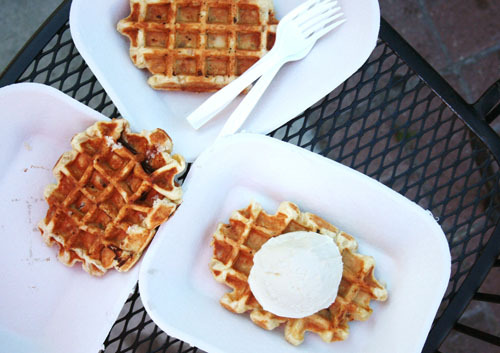 These LiÃ¨ge waffles were seriously to die for. They have these big old sugar crystals throughout and the dough must be yeast-based – the texture is really fantastic. And that big blob of delicious whiteness you see there? That’s a sweetened crÃ¨me fraiche that I will definitely be trying to replicate here at home. The frites (fries) portion of our nutritious dinner was mighty tasty as well. 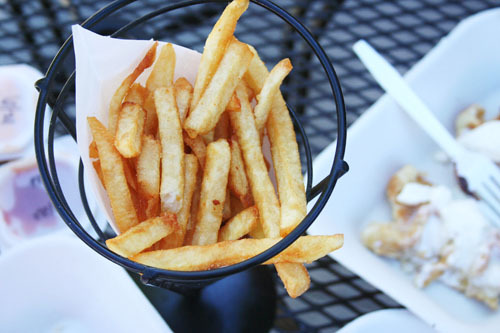 Yippee for Belgian frites with a bunch of different sauces to choose from (the Curry Ketchup Mayo – YUM). Thanks to the lovely Melissa Esplin for insisting that I meet her at Bruges for a quick bite. I drove home from Utah with the girls yesterday (p.s. still loving the Lincoln MKT that was lent to me by Ford). We survived. Barely. Got in around 11:30 last night and felt completely exhausted as well as totally hyped up (may have had something to do with the 5-hour Energy Drink I downed around 6 pm!). I have SO many posts in the works I can’t wait to share with you…but first I must unpack. Time for the shameless begging to begin…2010 BlogLuxe voting has begun! I’m a co-hostess for the Avery SocialLuxe Lounge, which will be held on August 5 in New York City! Each year we announce the winners of the BlogLuxe Awards at the party…and last year I was honored to be a winner in the Tastiest category, along with one of my most favorite people in the whole wide world, The Pioneer Woman. Voting has begun for this year’s BlogLuxe Awards, so of course I have to put in a shameless plug and get you to vote for This Week for Dinner in the ‘Tastiest’ category! You can vote on the Avery SocialLuxe Lounge website once per day through July 12. Just click here and follow the instructions. It’s painless, I promise. 🙂 And be sure to vote in the other categories as well! There are some amazing blogs nominated! The food workshop was at the Alpine House, a beautiful restaurant at The Canyons resort where the conference was held. The food session was amazing and I am so grateful I got to be a part of it. I will write more about my experience tomorrow or Tuesday. – Perhaps someone in Utah will feed us. Hint hint. Or I’ll hit one of the 8 kabillion delicious burger joints in town. – Driving home. Hello disgusting road food. Perhaps I’ll actually get some sandwiches packed before we go. – First day back, so it’s spaghetti night for sure! – Happy 4th of July! We’ll do cookout food for sure! Including potato salad…I’m really feeling like some potato salad. Please share your menus for the week – as always, I can’t wait to see them! Have a great week! I’m currently at the Evo ’10 Conference and having a blast…I mean, working really, really hard. I have lots to report on, but for now I just want to show you what I found at the Waldorf Astoria tonight. I’m pretty sure I know where they got that idea…I do have to say they may have improved it a bit…I love how the cucumbers are suspended in the ice. Good job, Waldorf. 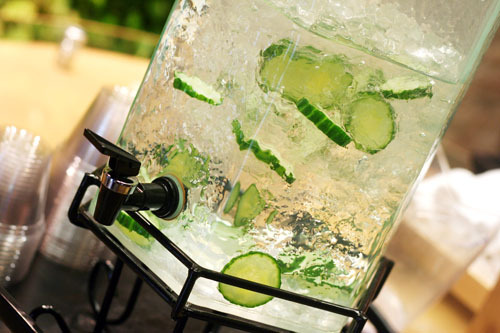 Cucumber Water…A Perfect Summer Drink! 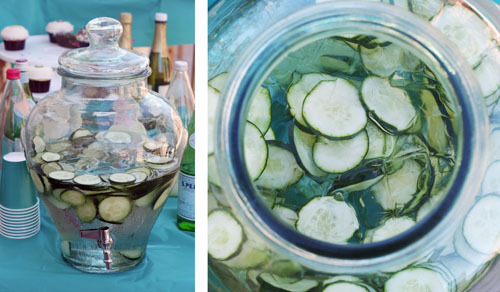 I recently attended a family reunion where my cousin Jamie served cucumber water. 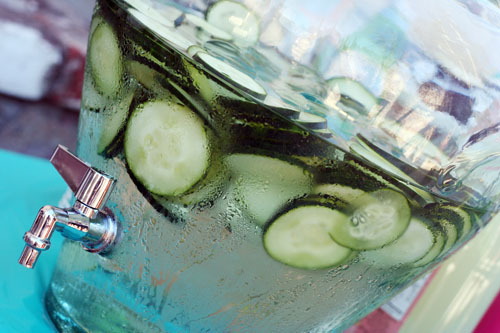 I don’t think I actually drank any…I don’t know why…but when I threw my party a few week ago, I decided to give the cucumber water a whirl. I don’t know what my guests thought, but I loved it. It was very refreshing and a really nice beverage on a warm, summery day. Tell me this picture doesn’t make you thirsty. I dare you. And since I know someone is going to ask about the beverage dispenser pictured, I borrowed it from my friend Ana. She got it at Costco. It’s perfect and I’m jealous and I don’t know if they have it anymore. There are a bunch of beverage dispensers on Amazon – this one comes closest to Ana’s in shape, but this hexagonal dispenser is pretty cool, too. I’m feeling pretty passionate about my salt and pepper lately. So I think I need to tell you about it. First, I’m loving kosher salt. I love the coarser texture it has versus table salt and, unlike a salt grinder, I don’t break my hand getting enough to use in recipes. I’ve been using it in almost everything I’ve been cooking lately. 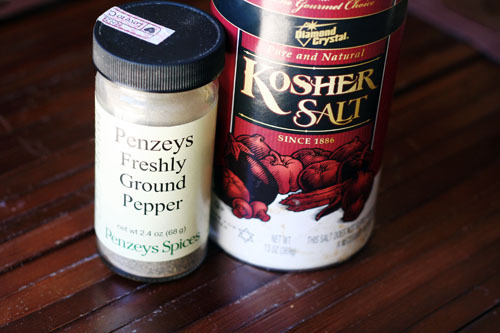 Second, and you need to listen carefully, Penzey’s Freshly Ground Pepper rocks the spice world. Seriously. I haven’t used my pepper grinder since I got this stuff. Sounds crazy, right? Maybe…but the flavor is just so good. That’s all for today. Happy seasoning! Week 178 Menu and Happy Father’s Day! Happy Father’s Day! Nate requested Indian food, so I’m making Murgh Makhani (Butter Chicken) today. I can’t wait to eat it myself! We’re having a combined Father’s Day-Birthday celebration for Nate today, and he’s requested Strawberry Shortcake for his birthday cake. I’ve never made traditional strawberry shortcake before, so if anyone has a good recipe for the biscuits, please share! The girls and I are driving to Utah on Tuesday, where I will be speaking at the Evo Conference (The Evolution of Women in Social Media). I’m SO excited and will definitely be reporting on the trip. This means I don’t have a menu this week, so I am relying on YOU to share and inspire one another! – Whatever I can throw together while frantically finishing up last minute trip preparations. I think I’ll be stealing one of your ideas from Friday’s post! – Driving to Utah in a Lincoln MKT (provided by Ford for our trip)…honestly, I can’t wait to drive bajillions of miles in that car! – Closing Party at Evo with Families! – Getting together with friends…probably potluck of some sort! See, I told you I didn’t have a menu. You really need to share your menu this week and do my job for me! Oh, and don’t forget to call your dad. What Do You Eat When You Don’t Eat What You Plan To Eat? It’s Friday. And Friday is all about slacking off, taking it easy, getting ready for the weekend. So, let’s discuss meal planning slackerness in honor of this the greatest day of the week. My dear friend Emily (whom I have mentioned before and is the reason I discovered and started blogging) just had a beautiful baby boy! The week before he was born, she ‘chatted’ me saying, “Can you do a post asking people what they eat when they don’t cook what they planned?” I thought this was a smashing idea, so here we are. Last summer, I tracked exactly what we ate versus what I planned for 4 weeks. This was a great exercise for me…but I’m still curious what YOU eat when you don’t eat what you plan. For me, every single week there is at least one day that diverges from the meal plan. That’s life, it’s gonna happen. But when that happens (which I think it does to most of us), what takes the place of the planned meals? Emily needs help, people. She just had her third kid. She’s sleep deprived. 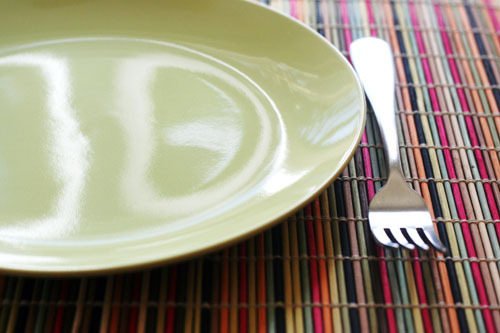 Let’s make her feel good about throwing her meal plans out the window…and offer up ideas (good or bad) for replacing those ditched dinner plans! 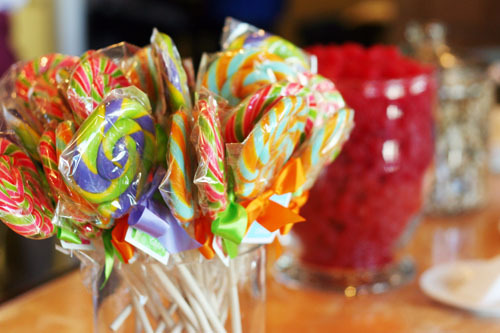 I’m super excited about my guest post on Make and Takes today. 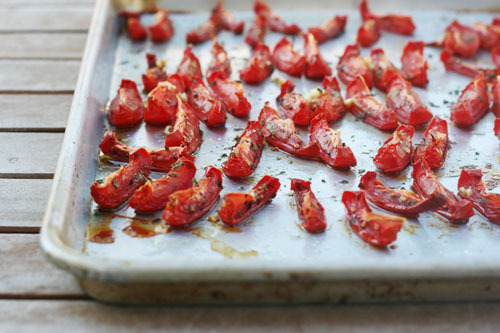 I made homemade roasted roma tomatoes for the first time and loved it! Not only were they easy and very tasty, but I really had fun photographing them! Big thanks to Faye and Ginger, who both commented on my menu post this week suggesting I roast the 12 romas I had lying around. I’m typing up the “recipe” below, but make sure to check out my full post on Make and Takes to get all the details and see all the photos! Spices you like – Oregano, Basil, Parsley, Red Pepper Flakes, whatever! Add minced garlic to the olive oil and let sit while you prepare the tomatoes. Slice tomatoes into wedges, 8 per tomato. Spread on cookie sheet and brush with garlic olive oil. Sprinkle with salt, pepper, spices, and sugar. Bake at 200ºF for 2-6 hours or so (5½ hours was my magic number). Store in the refrigerator drizzled in olive oil. 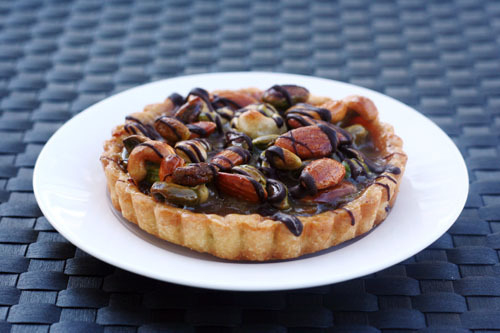 Remember this Spanish-inspired nut tart? For the dough (pÃ¢te sucrée): Mix the egg yolk, ½ teaspoon vanilla and 2 tablespoons cream and place in the fridge so that it's cold and ready to go. Cube 3 tablespoons of butter and refrigerate also. In a food processor, pulse the 1¼ cup flour, 2 tablespoons sugar, pinch of salt. Add 3 tablespoons chilled butter and pulse to crumble. Add the refrigerated egg yolk mixture and pulse until you have a cohesive dough, like a cookie dough. Smoosh into a disk in plastic wrap, and allow to rest for at least 30 minutes. For the filling: In a saucepan, allow ⅓ cup pear juice (or other juice) and ¼ cup brown sugar to dissolve. Add the 4 ounces of dates (or other fruits). Bring to a boil over high heat then cook for 1 minute. Process the mixture in the food processor to form a thick paste then let it cool. For the topping: Preheat the oven to 400º F. Roll out your chilled dough, fill your tart shell, and blind bake for 15 to 20 minutes. It should be fully baked. To blind bake, place a piece of parchment in the tart and fill it with beans. This will keep it from bubbling up. Remove the parchment and beans at the end and put it back in the oven for a few minutes. Now it's ready to fill. Cook first 6 tablespoons butter, 6 tablespoons sugar and 3 tablespoons corn syrup in heavy large saucepan over low heat, stirring until sugar dissolves. Increase heat and bring to boil. Boil vigorously 1 minute. Remove from heat. Add nuts and 1½ tablespoons cream. Spread fruit filling in crust; smooth the top. Set tart on a cookie sheet. Spoon nut topping over the fruit filling. Bake until filling bubbles, about 20 minutes. Transfer tart to rack and cool 10 minutes. Using oven mitts, loosen tart pan sides but do not remove. 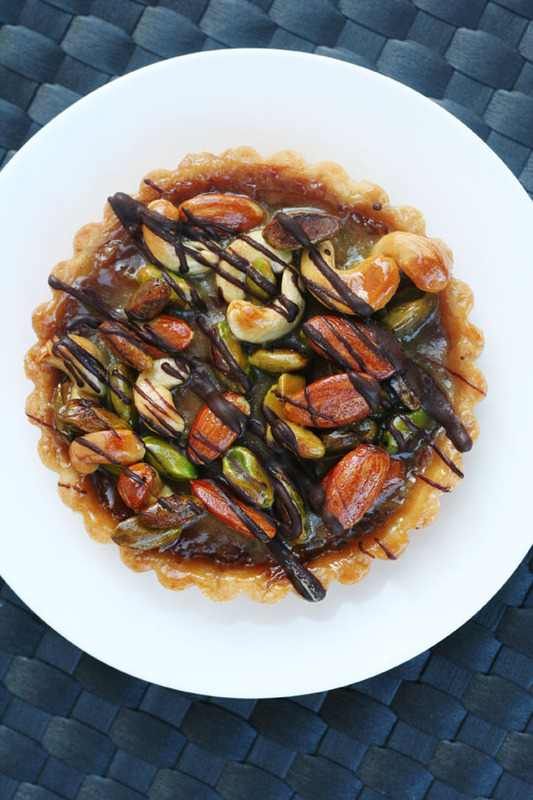 Cool tart completely in pan. (Can be prepared 1 day ahead. Cover and let stand at room temperature.) Remove pan sides. Cut tart into wedges. 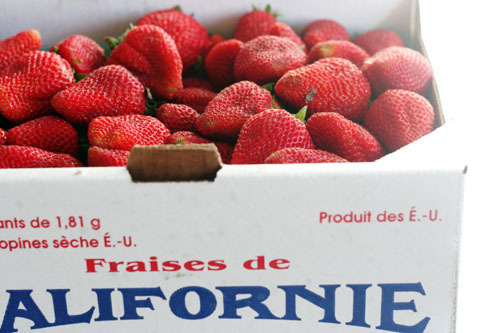 Lucky me…a few friends are getting together on Thursday and Faye is bringing goodies. What deliciousness will I be ‘subjected’ to, I wonder?